Organology, or the scientific study of musical instruments, has ancient roots. In China, a system of classification known as the pa yin or "eight sounds" was devised in the third millennium BCE. It was based on eight materials used in instrument construction (but not necessarily in sound production) and allied to other physical and metaphysical phenomena. More recently, but still in ancient times, the Indian sage Bharata outlined in his Natyashastra (ca. 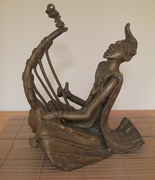 200 CE) a classification based on how the sound is produced: by blowing (sushira), setting a string in motion (tata), hitting a stretched skin (avanaddha), or hitting something solid (ghana). This system endures as a worldwide phenomenon today because Victor Mahillon adopted it for his catalog of the instruments in the Brussels Conservatory museum in the 19th century, and because his system was picked up in turn by Erich M. von Hornbostel and Curt Sachs in producing their seminal Systematik der Musikinstrumente (Classification of Musical Instruments) in 1914. Hornbostel and Sachs sought to universalize the Mahillon catalog by developing a hierarchy of terms that could encompass all the methods of sound production known to humankind. They used three of Mahillon's terms: aerophone, for the "winds and brass" of the orchestra and all other instruments that produce a sound by exciting the air directly; chordophone, for all stringed instruments (including the keyboards); and membranophone for drums. Hornbostel and Sachs replaced Mahillon's fourth term, autophone (for instruments whose body itself, or some part of the body, produces the sound – the Indian ghana type), with their newly coined term, idiophone, to avoid the ambiguous implication that an "autophone" might sound by itself. In Hornbostel-Sachs, an instrument is assigned a number. It may be a single digit, such as 1, indicating nothing more than the broad class, such as idiophone. More typically, an H-S number might have 3 to 6 digits, or as many as 9 or 10 (separated every three by a decimal point), to provide the degree of specificity needed to distinguish one instrument from another. The numbering method is based on the Dewey Decimal System, which was in common use by libraries at the time the system was devised. Although Hornbostel-Sachs is the most widely used method for classifying instruments, applied to instrument collections worldwide, translated into English in 1961, and taught regularly, it is also fraught with problems that have been tackled by many scholars over the century since its introduction. The system now includes a fifth term, coined by Francis W. Galpin in 1937, electrophone. The most current version of Hornbostel-Sachs, prepared in 2011 by the MIMO Consortium (Musical Instrument Museums Online), is available HERE. Copyright © 2015 Oberlin College Libraries.